Malaysian authorities appeal against sentence on grounds of being "too lenient". In what appears to be a remarkable act of vindictiveness, the Malaysian authorities are appealing against the sentence of £1800 or one year in jail imposed on Lena Hendry for showing No Fire Zone, claiming it is too lenient! Meanwhile Lena is appealing against the conviction. The campaign to #DefendLena and oppose Malaysian censorship continues. For more details about the campaign keep on reading the posts below. 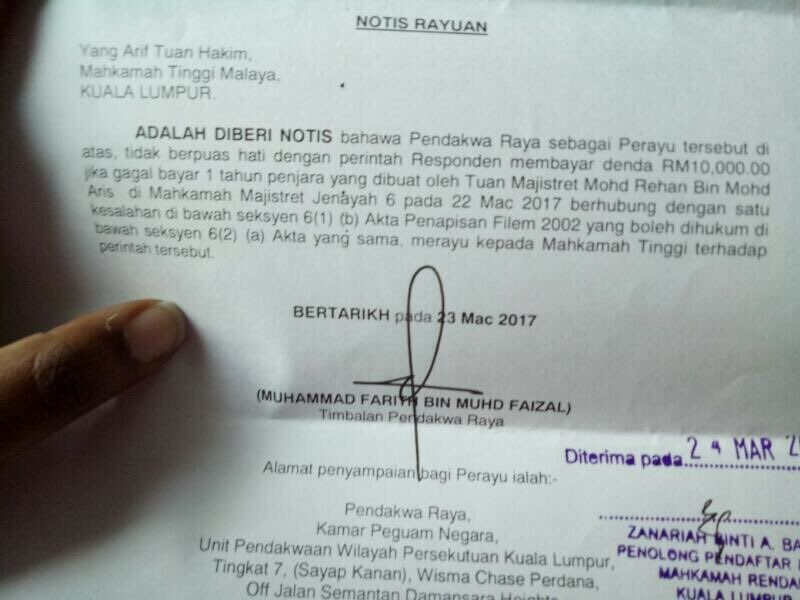 Malaysian Authorities inform Lena that they are appealing against her sentence on the grounds of being "too lenient"
The Magistrates' Court of Kuala Lumpur acquitted Lena of charges under the Film Censorship Act 2002, The court found that the prosecution had failed to prove its case against Lena. Protests world-wide over the conviction of Malaysian human rights activist Lena Hendry. 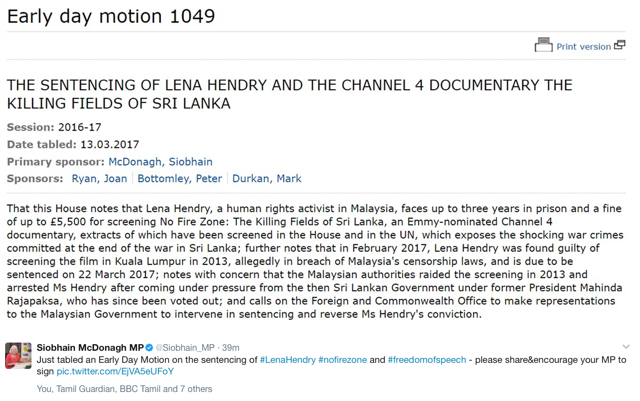 From Colombo in Sri Lanka to the British Parliament – the campaign to oppose Malaysian censorship and support Lena Hendry – goes international. Tomorrow, on 22 March, a Malaysian court is due to pass sentence on a human rights defender, Lena Hendry, for showing the film No Fire Zone: The Killing Fields of Sri Lanka. She was found guilty last month of screening the film - an award-winning documentary about human rights abuses at the end of Sri Lanka’s civil war - without the approval of Malaysia’s censorship authorities. She could face up to three years in jail and/or a maximum fine of 30,000 Malaysian Ringgit (£5400/$6700). The conviction has created international outrage among human rights defenders, anti-censorship campaigners and the public at large. Over the past month an international campaign has been underway demanding the Malaysian government to overturn the conviction and acquit Lena. Twenty-one British MPs from most of the UK’s main political parties have signed a parliamentary Early Day Motion noting “with concern” the conviction of Lena and calling on the government to intervene on her behalf. Pickets have been held outside Malaysian Embassies in cities around the world, from London to Zurich. 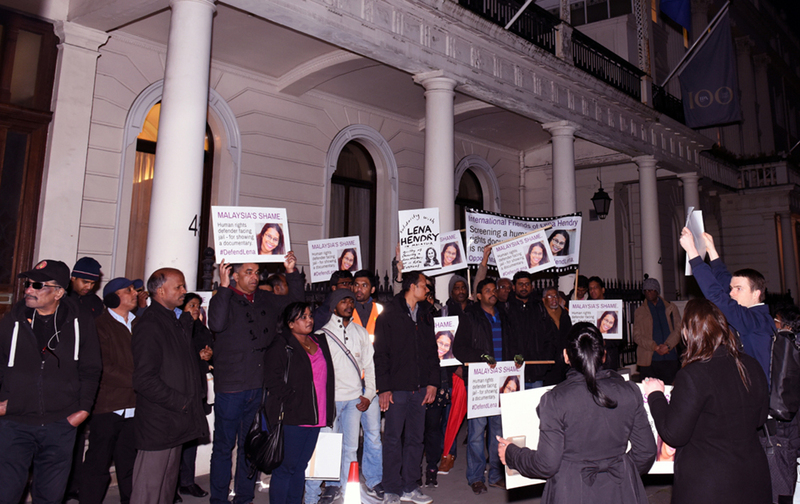 In the Sri Lankan capital of Colombo people from different communities, including Sinhalese and Tamils, came together in a demonstration outside the Malaysian High Commission to call for an end to the persecution of Lena. Campaigners also launched a social media campaign around the hashtag #DefendLena. In Malaysia, several NGOs arranged a screening of No Fire Zone, which they streamed directly from the internet - a means of viewing not covered Malaysia’s censorship law. A group of artists also produced a short film in support of Lena. Lena was prosecuted under Malaysia’s Film Censorship Act which criminalizes the possession, distribution, or showing of films which have not been approved by the country’s censorship board. It effectively makes any film – or even publicity about any film – illegal if it does not have prior approval from the censorship authorities. Critics argue that the reality is that the law is being used for political censorship and that is what appears to lie behind the conviction of Lena. The director of No Fire Zone, Callum Macrae, added: “The arrest of Lena appears to have followed pressure from the then Sri Lankan government of President Mahinda Rajapaksa, accused of command responsibility for many of the crimes exposed in the film. Rajapkasa has now gone, voted out democratically by the people of Sri Lanka. It seems grotesque that the Malaysian authorities are nonetheless continuing this inexcusable persecution of Lena." 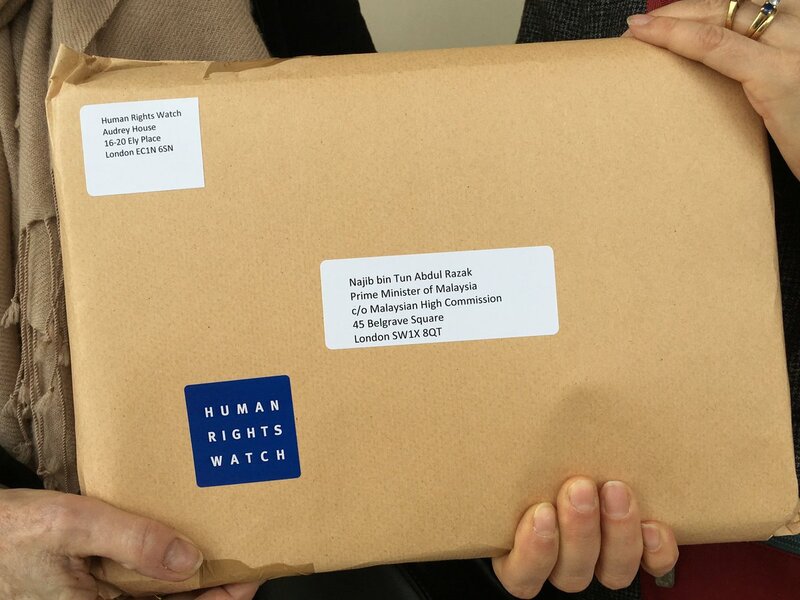 As someone who regularly shows human rights documentaries in cities around the world, I was shocked when my Human Rights Watch colleagues told me about the case of Lena Hendry, a Malaysian woman who could go to prison for showing a film of the type we show every year. We therefore decided to highlight the case to those who came to see our films at this year’s Human Rights Watch Film Festival in London. Former Pusat KOMAS staff member, Lena Hendry. Hendry was convicted on February 21 of organizing a private screening in 2013 of the film No Fire Zone: The Killing Fields of Sri Lanka without the approval of Malaysia’s censorship board. The film is an award-winning documentary about human rights abuses during Sri Lanka’s civil war. She faces up to three years in prison and a fine of 30,000 Malaysian Ringgit (US$6800 or £5500) under Malaysia’s Film Censorship Act, which criminalizes the possession, distribution, or showing of films that have not received permission from the country’s censorship board. As we shared the basics of Hendry’s case with our audiences, I could see that many were visibly uncomfortable with the thought that, if we were in Malaysia, we, too, could be facing charges for simply screening a human rights documentary or going to the movies to discuss it. More than 400 of those who attended signed letters of protest to show their indignation and to express their support. Hendry’s case strikes at the heart of two core values of the Human Rights Watch Film Festival: freedom of expression and the role of human rights defenders. The letters signed by our audiences will be delivered to the Malaysian High Commission in London today. 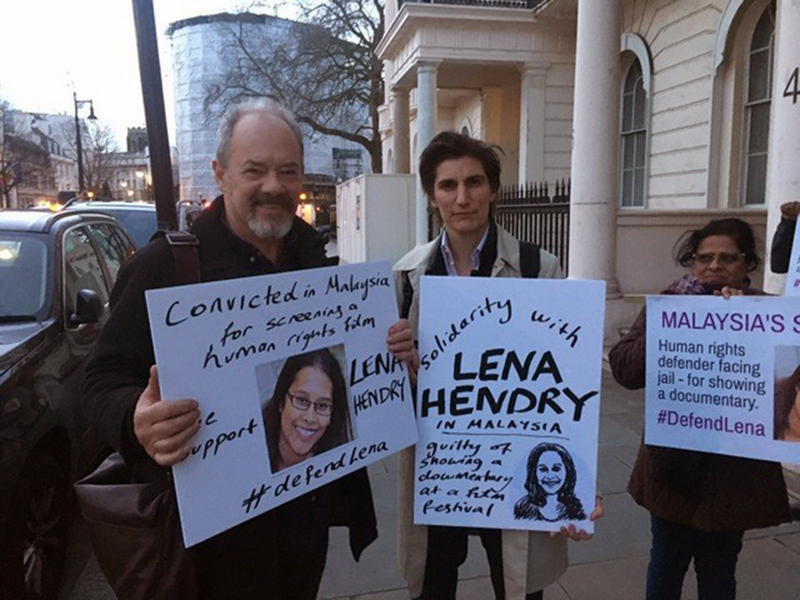 I hope that the Malaysian government will take note that their decision to prosecute Lena Henry for showing a film is causing outrage among ordinary people in London and around the world. Lena Hendry is a Programme Coordinator in Malaysia for Pusat KOMAS, a human rights organisation which works to empower indigenous peoples, urban poor, workers, and civil society organisations through the use of popular media.One such popular media source was the Emmy and BAFTA award-winning film “No Fire Zone: The Killing Fields of Sri Lanka,” which exposed many war crimes committed by the Sri Lankan army during their civil war. Indeed, this film has been screened in the Houses of Parliament and at the UN. Lena Hendry was charged for an offence under the Film Censorship Act 2002 for screening a film that was not approved by the Film Censorship Board of Malaysia – but in actual fact, she was charged under pressure from the then Sri Lankan President, Mahinda Rajapaska. Lena Hendry screened the film in July 2013 and was not tried until March 2016. She was originally acquitted, but after a prosecutorial appeal, Ms. Hendry was forced to undergo another trial in February 2017, the result of which found her guilty and facing a £5400 fine and up to three years in prison. Ms. Hendry is the first activist ever charged in Malaysia for screening a film. Ms Hendry’s trial was instigated under the pressures of then-President Mahinda Rajapaksa. His control over free speech, particularly of the human rights abuses during the civil war, continues, even though he has since been democratically removed from the presidency of Sri Lanka. Lena Hendry is due to be sentenced on the 22nd March, and I am urging you to intervene on her behalf.Surely it is our duty to intervene in this gross miscarriage of justice? I attach my recent EDM on this issue and a copy of Amnesty International’s report on Lena Hendry’s case. I very much look forward to your response. Siobhain McDonagh MP for Mitcham and Morden has tabled the following Early Day Motion calling on the Foreign and Commonwealth office "to make representations to the Malaysian Government to intervene in sentencing and reverse Ms Hendry's conviction". As many of you will know, Lena Hendry is a Human Rights Defender from Malaysia who has for more than three years been fighting a prosecution brought by the Malaysian authorities for screening No Fire Zone: The Killing Fields of Sri Lanka, allegedly without permission from the country’s Censorship Board. The letter below explains the background to this disgraceful case. Yesterday, Tuesday 21st, Lena was found guilty and faces a maximum sentence of three years in jail and/or a maximum fine of 30,000 Malaysian Ringgit (£5400/$6700). Her sentence is due to be passed on the 22nd of March. We have very little time to make abundantly clear to the authorities in Malaysia that we regard the use of this draconian law to deny freedom of speech and persecute Lena as completely unacceptable and that it is extremely damaging to Malaysia’s international reputation. Please also share this on social media such as Facebook - and if possible print it out and send it individually to the people listed on the letter. You may prefer to put the letter as a link on your own website which can also be used on twitter. 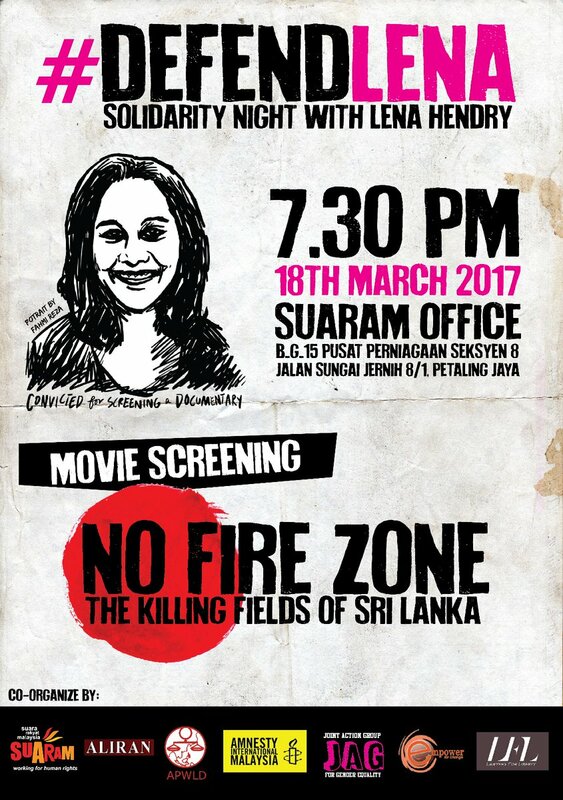 On Tuesday 21st February 2017, Lena Hendry, a human rights defender in Malaysia, was convicted of showing the film No Fire Zone: The Killing Fields of Sri Lanka - an award-winning documentary film about human rights abuses at the end of Sri Lanka’s civil war - without the approval of Malaysia’s censorship authorities. She is due to be sentenced on the 22nd March this year. I wish to protest in the strongest terms about this disgraceful conviction which flies in the face of every principle of free speech and democratic debate. Lena faces a maximum sentence of three years in jail and/or a maximum fine of 30,000 Malaysian Ringgit (£5400/$6700) under Malaysia’s Film Censorship Act which criminalizes the possession, distribution, or showing of films which have not been approved by the country’s censorship board. It effectively makes any film – or even publicity about any film – illegal if it does not have prior approval from the censorship authorities. The reality is that the law is being used for political censorship,and that is what appears to lie behind the conviction of Lena. On the 3rd July 2013 the Malaysian human rights organization Pusat KOMAS showed No Fire Zone: The Killing Fields of Sri Lanka to an invited audience of 150 people in Kuala Lumpur, at a screening attended by the film’s director, Callum Macrae. The group went ahead with the screening despite pressure from the Sri Lankan government whose forces were accused in the film of responsibility for war crimes. As the screening got under way it was raided by 30 officials from the Malaysian Home Ministry, the Police and Immigration Officials. Three organizers were arrested and Lena was subsequently charged in September 2013. A three year-long legal battle ensued culminating in this guilty verdict. The use of this draconian law to attack and prevent freedom of speech is disturbing and unacceptable, and is in danger of bringing Malaysia into international disrepute. The Emmy and Bafta nominated film which Lena is charged with showing is now widely and internationally acknowledged to have played a key role in exposing the terrible atrocities committed at the end of the war in Sri Lanka. It also helped convince delegates to the UN Human Rights Council to launch a major inquiry into the events which saw tens of thousands of innocent Tamil civilians slaughtered in the space of a few weeks – most killed by government shelling. The Sri Lankan government which ordered that shelling – and which tried to stop this screening – has now been replaced by popular vote of the Sri Lankan people. But many of its leading members and military officials stand accused of direct command responsibility for war crimes and crimes against humanity. History has vindicated the film. Yet while the perpetrators of the crimes it exposed walk free, Lena faces jail for showing it. Her conviction is a denial of free speech which brings shame on Malaysia and should immediately be overturned. Callum Macrae, the Director of ‘No Fire Zone’, a documentary that exposed war crimes largely committed by Sri Lankan armed forces during the final months of the war, has called for a demonstration in defence of in defence of Malaysian human rights activist Lena Hendry, who has been found guilty for screening the documentary allegedly without the permission of the Malaysian authorities. The demonstration urging the Malaysian government to drop all charges against Lena and respect freedom of speech has been organised on Thursday (March 09) evening opposite the Malaysian High Commission at Belgrave Square in Central London. 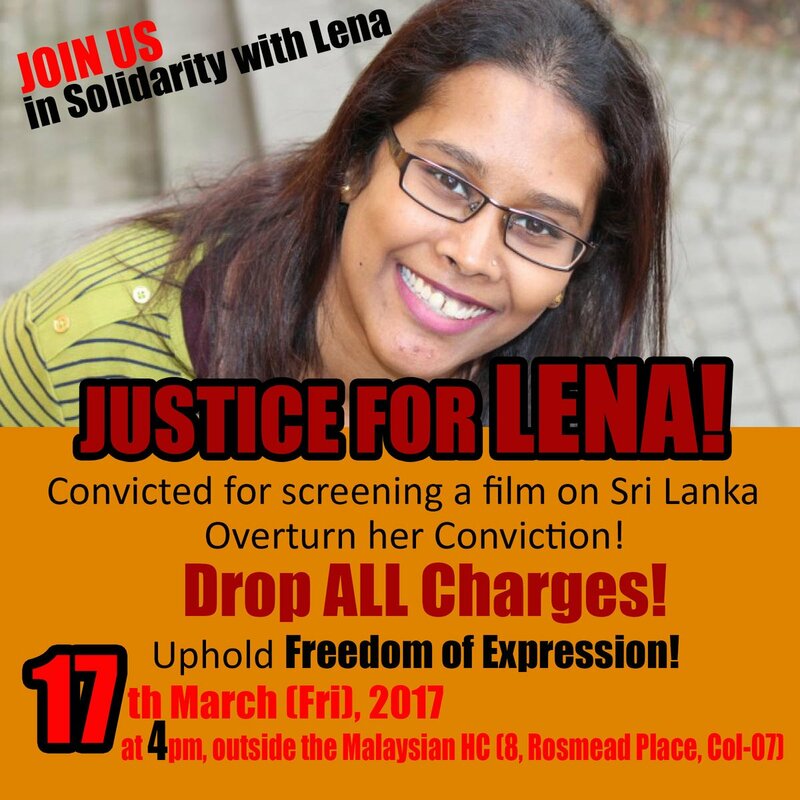 Lena’s arrest and persecution, human rights activists say, have been a direct result of pressure from government of Sri Lanka officials seeking to suppress the film. She will be sentenced on March 22, and faces three years in jail and/or a maximum fine of 30,000 Malaysian Ringgit (£5400/$6700). 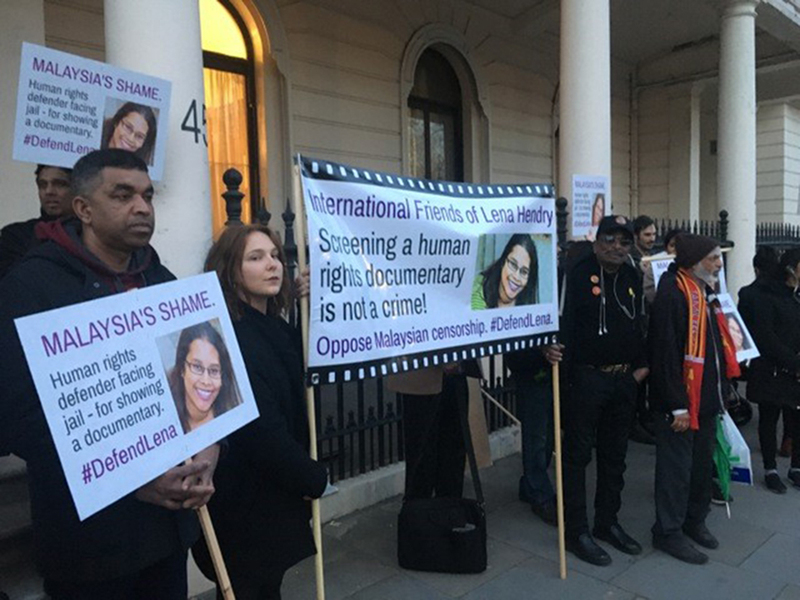 “We are calling on the Malaysian authorities to immediately drop the charges against her and overturn the conviction,” the Film Director told Ceylon News on Tuesday.